Originally built by the counts of Anjou in the 11th century, this magnificent castle today is the property of the Duke of Brissac – the Cossé-Brissac family. At seven storeys the castle is the tallest in Loire valley and therefore nicknamed the ‘Giant of the Loire valley’.The castle structure as seen today was rebuilt in the 15th Century by Pierre de Brézé, the wealthy Chief Minister of King Charles VII of France. However, the castle architecture shows some Baroque influences which were probably added during the 17th Century. The castle gardens, inspired by the Romantic period. Enjoy the Jeanne Say's waterfall, vineyards and so on. The 500 year old estate vineyards and a wine cellar. Underground canal, 250 m long marvel of civil engineering during those times. Private opera house, Belle Époque, born out of the ambitious dream of Lady Jeanne Say-Marquise Brissac. A talented soprano herself she hosted many concerts at the Castle’s Opera house. For a more unique experience one could also indulge in an exclusive overnight stay at the castle. Open on school holidays other than a Tuesday. The village of Brissac-Quincé is just 15km from Angers. A dual carriageway connects the two towns. By train: Angers TGV train station is 17km away. 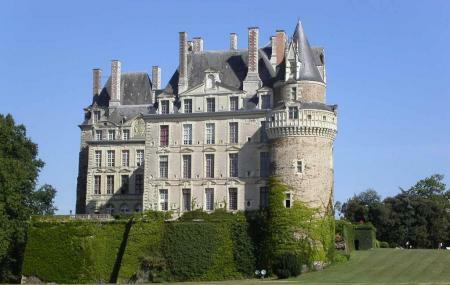 How popular is Chateau De Brissac? People normally club together Chateau D' Angers and Prieure Saint-remy La Varenne while planning their visit to Chateau De Brissac.